"Respect. Inclusiveness. Diversity. Fairness: These are the values The University of Western Australia pledges to uphold. We, the undersigned, call on UWA and all other Australian universities to honour this commitment. Academic freedom and fact-driven discourse should be at the core of any university. 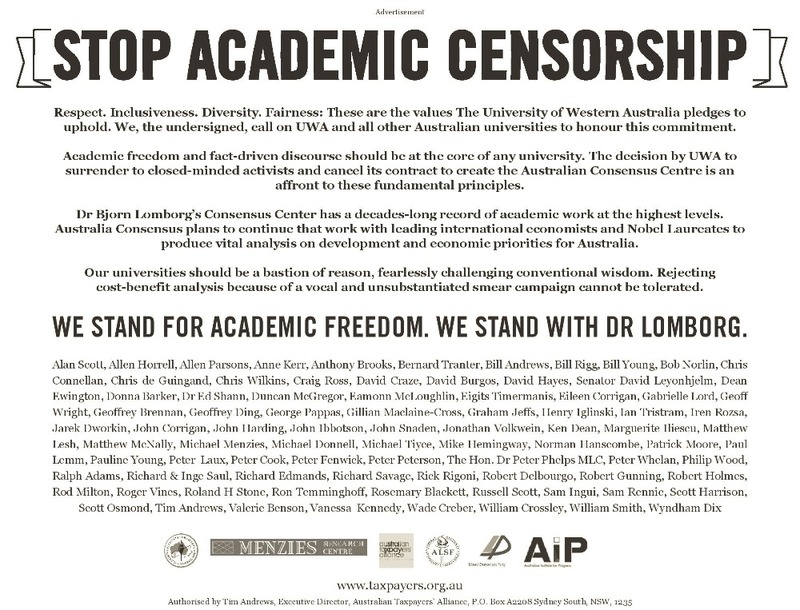 The decision by UWA to surrender to closed-minded activists and cancel its contract to create the Australian Consensus Centre is an affront to these fundamental principles. Dr Bjorn Lomborg’s Consensus Center has a decades-long record of academic work at the highest levels. Australia Consensus plans to continue that work with leading international economists and Nobel Laureates to produce vital analysis on development and economic priorities for Australia. Our universities should be a bastion of reason, fearlessly challenging conventional wisdom. Rejecting cost-benefit analysis because of a vocal and unsubstantiated smear campaign cannot be tolerated. We stand for academic freedom. We stand with Dr Lomborg." Any surplus funds, or if the target will not be met, will be dedicated entirely to other activities promoting academic freedom in Australia. Thank you for your generous support for this very worthy cause! Here's a preview of our ad set to go out in Tomorrow's Australian! We're still a little short of required funds, so anything you can do to help us get over the line will be appreciated! Almost there! We just need another $2,000 for a half page ad to go to print in The Australian this Wednesday! Please encourage all your friends to donate and help us get over the line! The actions of the University of Western Australia are nothing short of a disgraceful capitulation to a vocal minority. The Australia Consensus Centre should seek an alternative home to continue its vital work for Australia. I look forward to interviewing a UWA graduate for a job. They will be coming from a significant disadvantage because they will need to prove to me that they can actually think for themselves and properly analyse data and real life situations. The harm done to this institution by its cowardly VC and the groupthink academics cannot be underestimated. For an institution dedicated to inquiry and learning, this is the equivalent of a cowardly flee from the battle field. This single event encapsulates everything that is wrong with the AGW debate. There simply is no debate. Not even amoung the faithful. It has morphed into a totalitarian ideology, for the advancement of achieving socialist wealth redistribution. The campaign needs to expressly call for the resignation of UWA Vice Chancellor Paul Johnson. It is not sufficient to just question his decision. The man has proven himself utterly unfit for his job, by acting contrary to the core purpose for which he was appointed. If he had done something conservative, the left would have hounded him out of office by now. The left learnt long ago to play the man and not just the ball. That is why they always win and conservatives always lose. We are in a street fight for the future of our society, but we keep playing by Queensbury rules. This is nothing new or a surprise. The socialist and leftist ideology has been entrenched into our universities for decades. With these people it’s their view and ideology or nothing, they continually and violently protest at every venue that universities around Australia hold, when their guests are of either the political side or the scientific side. If their point of view is not mirrored then they become violent and as in Mr Bjørn Lomborg case and as we can remember with our foreign ministers case Ms Julie Bishop case impossible. If we don’t do anything about this then our universities will become the trenches of socialist and leftist ideology that will be impossible to curb. While not a graduate of UWA, I am a West Australian and am appalled that the Leadership of the University could succumb so easily to such a non-nonsensical campaign. It does not bode well for the future of UWA or the broader academic environment. It all depends on whether we are willing to repent of our wicked ways and turn to seek his face (unconditional Love) or not. Freedom isn't Free. Only those who have fought for Freedom will ever understand what Freedom is. And it is this Freedom that gives the Socialist Left as well as the Communists the Freedom to push their barrow of garbage down a Free Road obtained by others. These Parasites only exist because others supply the means for the Freedom they enjoy. Attention!!! Do you have a bad credit? Do you need money to pay bills? Do you need to start up a new business? Do you have unfinished project at hand due to bad financing? Do you need money to invest in some area of specialization which will profit you? and you don't know what to do. I am Mr. Maleek Johnson, a private money lender. I give out loans with an interest rate of 3% per annual and within the amount of 1,000.00 to 10,000,000.00 as the loan offer. 100% Project Funding with secured and unsecured loans are available. We are guaranteed in giving out financial services to our numerous clients all over the world. With our flexible lending packages, loans can be processed and funds transferred to the borrower within the shortest time possible. We operate under clear and understandable terms and we offer loans of all kinds to interested clients, firms, companies, and all kinds of business organizations, private individuals and real estate investors. Just complete the form below and get back to us as we expect your swift and immediate response. EMAIL : maleekfinancials@yahoo.com We offer the following loans below, *personal loans[secure and unsecured] *business loans[secure and unsecured] *combination loans *students loans *Auto Loan Refinance *consolidation loans and so many others. Interested applicant should please fill our application form below. FIRST INFORMATION NEEDED Full Name .......... Age ....... Personal Phone Number ....... Country ...... Email ............ Address ........ State ..... Have you applied before? ..... Marital Status ............ Loan amount needed as loan ............ Loan Duration ....... Occupation ........ Monthly Income........ Do you understand English?.......... In acknowledgment to this mail, we can start with the processing of your loan. There is more to gain by getting a loan from this company. Regards, Maleek. As a right wing moderate conservative , I too concur that freedom of speech is under attack from the scourge of political correctness. A democracy is the foundation for discussing all ideas, not only with those you agree with! The left is wrecking havoc and bullying those into silence. Freedom isn't free, it must be continuously protected against those who would destroy it. Best of luck. I can't afford this, but WE cannot afford not to.